Fit Fridays: Eat More Non-Starchy Veggies! Hello and Happy Friday! I don’t pay attention to the weather reports so I genuinely had no clue what the weather would be like today. I wondered if it would be rainy again or cold and windy but so far, it looks like a lovely spring day! In short, I’m really pushing the #HappyHealthyApril Challenge as a way to combat all the negative expectations we start to see as we get closer to summer, aka “bathing suit season”. I want to counter all the diets to get that “bikini body” and the workouts to shred fat and boost that booty. I believe in living a balanced lifestyle and that being healthy and happy is about a combination of mental, physical and nutritional health. We are so much more than a number- so much more than our size, shape and appearance. 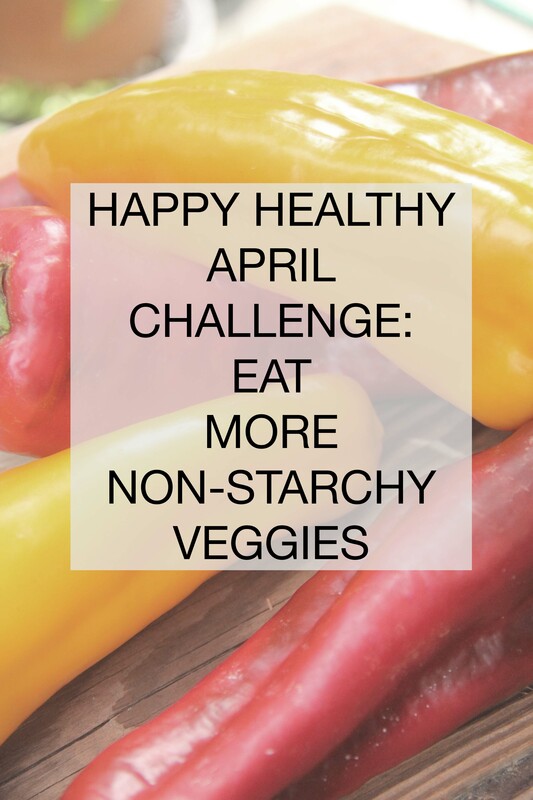 So with the idea of health in mind and a happy healthy April, I wanted to focus this Fit Fridays post on a healthy diet, specifically through eating more non-starchy vegetables. Now, all veggies are inherently good, but non-starchy vegetables, such as leafy greens, asparagus, broccoli, peppers, eggplant and beets are basically one of the foods you can eat endlessly. Non-starchy vegetables are full of fiber but lower in carbohydrates than starchy vegetables (i.e. potatoes, sweet potatoes, corn and winter squash), and thus are lower in calories so they are essentially considered a “free food”. I personally enjoy that I can eat them in abundance. Being full of fiber, non-starchy vegetables are great for maintaining blood sugar levels, aiding in proper digestion and bowl movement as well as promoting good gut health by providing prebiotics, which serve as food for your gut bacteria. By eating a variety of non-starchy vegetables daily, you are also consuming a variety of vitamins and minerals that are essential to proper health. I’d like to go into detail about the specifics with regards to which vegetables contain which vitamins and minerals and the benefits of each but I’d like to save that for another post. I’m quite sure you’ve all heard that you should eat more vegetables but – and I know this from personal experience- there’s a difference between knowing and doing. That’s why I am challenging myself to incorporate vegetables into each and every meal (yes, I mean breakfast too!) this month and I’d like to challenge you to do so as well and join me. To prepare for this, I’ll be heading out shortly to stock up on lots of veggies before I start prepping them by steaming, sautéing and roasting them in batches to make them easy to incorporate into meals during the week. I think my biggest challenge will be adding them into breakfast daily. It will take a little more forethought but I think it’s doable- more green smoothies, maybe adding more greens to scrambled eggs and omelets or maybe some chopped veggies on top of a piece of toast. As I work through this, I’ll be sharing about it here and on Instagram using the hashtag #HappyHealthyAril- I hope you’ll join me and share what delicious meals you create or healthy habits you are working on mentally, physically and nutritionally.